I got this really cute, fuzzy blanket as a baby gift when Spike was born. Each time I would look at it, I would marvel at how closely it resembled Cookie Monster's fur. 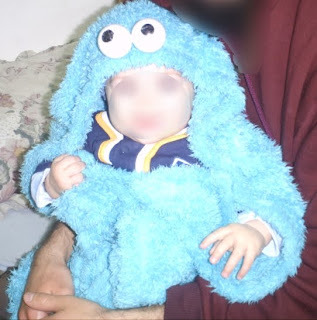 When the time came that I required costumes for my two children, I knew that I would turn that blanket of Spike's into a cute Cookie Monster costume. But how? As someone to whom recycling and frugality is important, I didn't want to make the costume in a way that it would cause the blanket to become ruined and unusable. That put any cutting and gluing out of the picture, as those would both ruin the blanket for further use. 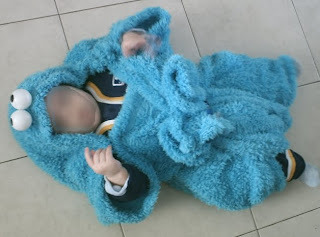 Here is the idea with which I came up that left the blanket whole and made a cute recognizable Cookie Monster for my baby using mainly things I already had in my house. 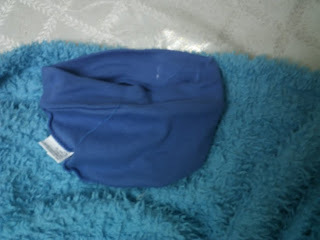 Take the hat and place it open side up along the edge of the blanket, somewhere around the middle of the longer side. Loosely stitch one side of the hat onto the blanket. I would suggest doing this by hand and with thick stitches so that it is easier to undo when you are finished with the costume. Fold over the edge of the blanket towards the middle. You want to have a good half a foot or so overlap of material, as this will become the "sleeve" of the outfit. Sew a snap onto the blanket- one on the corner and one on the main part of the blanket. If you look closely at the picture, you can see the snap sewn on. The other snap is sewn onto the underside of the folded over part of the blanket. The next three steps have no picture, sorry. I bought a package of ping pong balls from a discount store. I paid 50 cents for six of them and used 2 of them for my Big Bird costume, which will be posted tomorrow. Take a black permanent marker and colored black circles onto two ping pong balls. These are for the eyes. Using your needle and thread, poke a two holes through the side of your ping pong balls. This the hardest step, but with a little effort you'll succeed. I found that leaning the eye of the needle into a hard surface and pushing the ball onto the needle worked best. You want the two holes you make to pretty much be level so that your Cookie doesn't end up cross-eyed. Pull the thread through and repeat this same process on the second ping pong ball. Pull the string tightly together and tie it so that you have two ping pong ball eyes attached, looking at you. Flip your blanket over so that your hat is facing downward. Sew these ping pong ball eyes onto the blanket directly on the reverse side of the blanket from the hat. You're pretty much done now. Take your baby and put the hat on his head. You want to center it so that the eyes are above his eyes. Make sure the snaps are closed and put his arms through the "sleeves". You'll want to wrap the extra parts of the blanket around the waist/chest and up between the legs to create "pant legs. Secure the whole thing with a belt tied around the waist. Caveat- this costume probably wouldn't be the greatest for crawlers/walkers, but I could be wrong. It was perfect for my son who only really was going to be in a costume long enough to snap a few pictures. Reversible? Easily. Just snip the few strings holding on the eyes and the hat and you've got a blanket ready to be used. 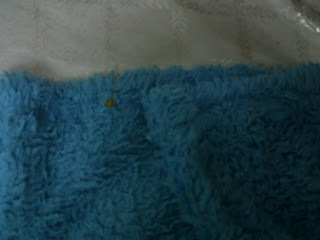 The snaps can also be removed, but its completely unnecessary as it does not impair function of the blanket at all. Tune in for tomorrow for a homemade Big Bird costume. Have you ever made a costume from scratch? How much did it cost you? Have you ever seen a piece of something that inspired you to make a costume based on that? If so, what was that something that inspired the costume? This is part of Creative Jewish Mom's Craft Schooling Sunday.